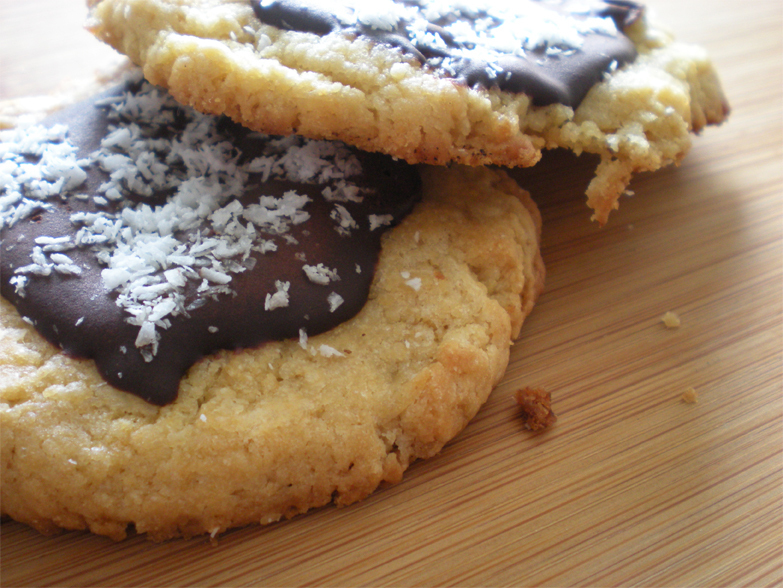 This cookie recipe is one of my favorites so far. I got this recipe from YumSugar and it is a Mrs. Field’s cookie recipe. The original recipe is a chocolate chip cookie, but I find that if you take out the chocolate chips, you have a pretty good base for any kind of cookie you want. I have made chocolate chip and I have made peanut butter chip cookies using this recipe. This time, I took out the chocolate chips and instead coated the cookies with it. Then I sprinkled them with coconut. And, since this is the Goodie Plate, I lessened the sugar. Bake at 300˚F for about 20 minutes. In a medium sized bowl take: 2 1/2 cups all purpose flour, 1/4 teaspoon salt and sift in 1/2 teaspoon baking soda. Give it a good mix. In another bigger bowl, mix 1/2 cup brow sugar and 1/2 cup white sugar. Chop up the cold butter and mix it in with the sugars. The mixture should have tiny clumps of un-melted butter in it when you’re done mixing. Next, add in 2 eggs and 2 teaspoons of vanilla extract. Mix well. Add the flour mixture to the sugar mixture. Mix just until you cannot see flour anymore. Refrigerate the dough for 30 minutes before you bake the cookies. Bake at 300˚F for about 20 minutes. I baked mine at 250˚C for about 15 minutes, because that’s just how my oven works. Immediately transfer the cookies to a cool surface after baking. 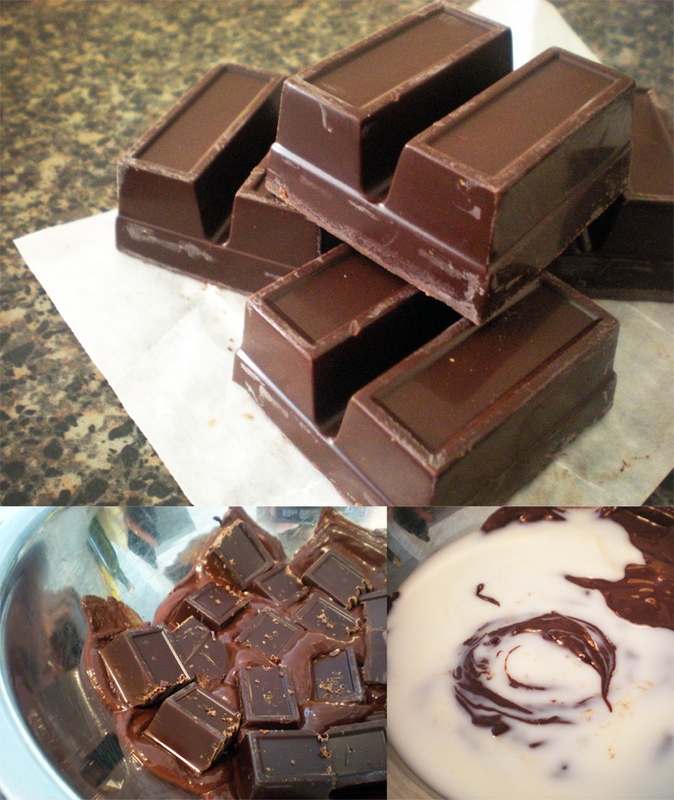 Take the chocolate, chop it and melt it using a bain-marie. When the chocolate is fully melted, add to it 4 tablespoons of milk and mix it in well. This makes the chocolate easier to spread, plus it gives the chocolate a creamy, mousse like texture. However, if you want to, you can leave the milk out. When the cookies have cooled down, spread a spoonful of the chocolate on top of each cookie. 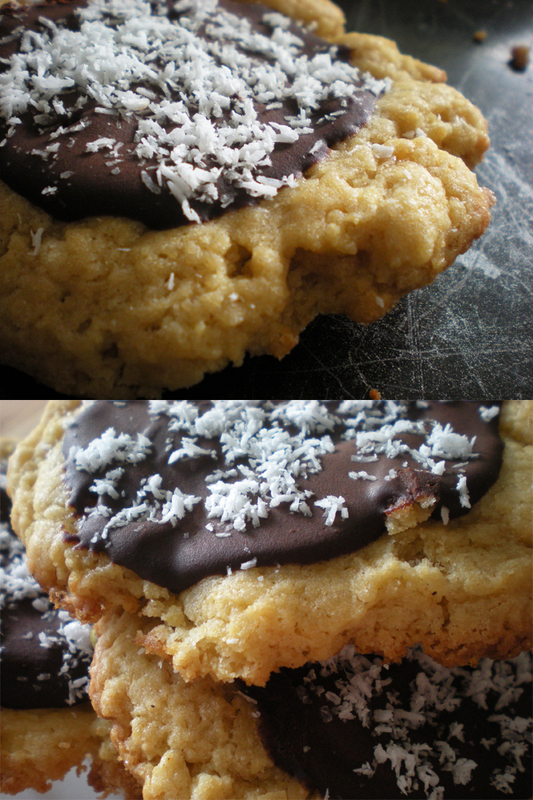 If you like sprinkle them with some unsweetened shredded coconut. It is very recommended by me. After you’re done topping your cookies, cover and refrigerate them for about an hour until the chocolate sets. Enjoy your cookies! Keep covered and refrigerated. Thank so much for the nomination! It’s very appreciated. You’re welcome ! You have nice blog. Looks fantastic–I totally want to make these right now! Thanks for posting! Mmm…that pool of chocolate on the top of those cookies looks delectable!